Conventions not only bring attendees but their spouses and family members as well. While your meetings are in session, why not provide some fun entertainment options for the family. 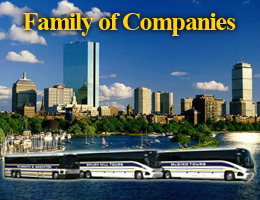 Choose from our 14 Gray Line Sightseeing tours including Boston, JFK Library and Museum, Plymouth – America’s Hometown, Salem – The Witch City, Cape Cod, The New England Seacoast (includes New Hampshire and Maine), The Fabulous Newport, R.I. Mansions, Fall Foliage , an authentic ‘Downeast Maine’ Clambake or shopping at the Wrentham Village Premium Outlets. If a casino visit is on your group’s must see list, Foxwoods Resort Casino, located in Ledyard, CT is only 1 hour and 45 minutes away from Boston. Foxwoods has six casinos, multiple 5-star restaurants as well as a daily buffet and fast food options. Exclusive retailers, spas and state of the art theatres make Foxwoods the ultimate entertainment destination. We can customize any tour for your group or even plan something different altogether. If your group is small, individuals can reserve seats on our scheduled Gray Line tours. Contact Brush Hill Tours today and request a quote online or call our sales staff at 781-986-6100.